For the first half of 1944, World War II was on every Lodian’s mind. The war was in full swing, with months to go until D-Day. Giant headlines at the top of the front page each day blared the news of air strikes in France, Army pushes into Italy, and naval warfare in the Pacific. But it was a little more local than usual on Jan. 3, the day after a B-17 Flying Fortress crashed while attempting to land at McClellan Field in Sacramento. It slammed into the runway during landing, scattering wreckage over a 15-mile area and killing all but one of its 14 crew members. The lone survivor was Maj. James W. Wergen of Arizona, who parachuted from the burning war plane but told reporters he could not remember pulling the ripcord of his chute. Two days later, the News-Sentinel reported the death of Eldon Baumbach. The Marine, a former Lodi resident who was serving alongside his cousin Oliver, was killed in action during a landing at Tarawa in the Gilbert Islands. Oliver Baumbach, whose parents still lived in Lodi, was unharmed. And on Jan. 8, Ensign Frank Everts Mills was killed in the line of duty, though details were sparse. Another Flying Fortress crash outside Las Vegas was less deadly than the Sacramento wreck, the same edition reported. Staff Sgt. Melbourn Ellsworth Angier, whose parents were ranchers in the Live Oak district, and 10 fellow crewmembers survived, though all spent more than 24 hours fighting the elements and had to be treated for exposure. While the big battles and devastating losses of local residents got the largest headlines, chatty updates on Lodi men and women serving overseas were a regular feature on the front page, along with news about efforts on the homefront. A story on Feb. 4 reported that Lodi had raised more than $1.5 million in a bond campaign. The show “Bonds Away,” an Army performance that would visit Lodi, was sold out, the same story reported. Anyone who had purchased tickets to support the bond drive but who didn’t plan to attend the show was asked to return them, so that those on the waiting list to see the performance could buy them. In some cases, local residents pushed their way into national and international stories. Even though Lodi’s citizens of Japanese descent had been evacuated to internment camps, they faced suspicion and outright hostility from local residents. Such was the case when the Lafayette Farm Bureau voted on Feb. 20 to ask the state to seize land owned by Japanese-Americans and sell it to veterans at a discount after the war’s end. The young woman went on to discuss the internment camps, noting that inmates had created councils, police departments, newspapers and stores within each camp. Despite those sentiments, James H. Jurata, “Mauch” Yamashita and other Japanese-Americans from Lodi were serving in Italy and France as part of the 442nd Regimental Combat Team — an almost entirely Nisei Army unit that became the most decorated in U.S. military history. A number of the members of the 442nd served while their families were held in interment camps. And in May, Sam Funamura returned to Lodi after obtaining a special permit from the War Relocation Authority and Western Defense Command. While he had been employed as a machinist in Chicago, he was returning as a former member of the California State Guard to gain permission to enlist in the Army — the fifth in his family to do so. He gained permission in 1943, along with other Japanese-Americans, to leave the Rohwer camp in Arkansas and find a job. About 10,000 former Californians of Japanese descent were employed in Chicago, he told the Lodi paper. The Californians and Chicagoans were mistrustful of each other at first, Funamura said, but by May were getting along very well and had accepted one another. As Lodians read headline after headline from Italy, Belgium, New Guinea and Palau, some of those distant locales carried news of local men and women. On March 25, the News-Sentinel shared sad news — along with a hint that an end to the war might someday soon be in sight. Sgt. Glenn Happe, a Lodi High football star-turned-Marine, had gone missing in action on Nov. 30, 1943. His mother received word that he had been killed in action. The news of Happe’s death was overshadowed only by a blaring headline: “Invasion ‘Zero Hour’ Nearing.” Though Lodians reading that Saturday newspaper couldn’t have known, in just a little more than two months the Allies would be storming French beaches in a massive push to drive the Nazis back. Happe’s family weren’t the only ones left in limbo for months, hoping against hope that their loved one would be found alive. On April 11, the mother of Lt. Jack Hargis told the News-Sentinel that she was holding out hope he was in a prison camp. Hargis’ Flying Fortress failed over northern France. Hargis stayed at the controls during the Aug. 17, 1943 disaster, while the rest of his crew leapt to safety. The last to jump was his co-pilot, who said Hargis had pushed him out of the plane. The co-pilot, named only as Smith, landed in a beet field in Belgium and was smuggled out of the country by the underground. Hargis’ family hoped they would receive word he too had been rescued. Eight months after his disappearance, his family was still wondering and hoping. On May 25, his family’s hopes were dashed. Hargis had died when his parachute failed to open, the War Department told his family. Word that a child had been taken prisoner was no guarantee of their safety. On April 26, the News-Sentinel reported that Lodi native Pfc. Melvin E. Binder of the U.S. Marine Corps had died of pneumonia in a Japanese prison camp. His four brothers and two of his brothers-in-law were still serving. Cpl. Ervin R. Glantz of Lodi was reported missing on March 31, 1943 in action in Tunisia. In May 1944, his parents received notice that he would be considered officially dead. 2nd Lt. Ernest G. Nolte Jr. of Fresno, husband of Lodi native Kathryn Macdonald Nolte, was killed in Italy on April 5, 1944. He was the pilot of a B-34 Liberator bomber. Cpl. George C. Wheelock Jr., who lived in New Mexico but was born in Lodi, was killed April 19 in the India-Burma theater of war. He was a member of the First Air Commando Forces. Lt. William Bigelow, a Stockton native with close family in Lodi, was killed in a plane crash in Iceland on May 7. Lt. Joseph R. Patton of Lodi was reported missing in the Pacific Theater on April 30. As of May 20, his family had received no further word on the pilot. On May 13, wire news services reported that the Fifth and Eighth Armies were beginning a massive artillery push into Italy. After weeks of speculation at home and overseas about a major Allied invasion into Europe, the Germans seemed convinced D-Day was upon them. “German broadcasts, bordering on hysteria, said ‘this is D-Day.’ A Nazi-inspired Radio Paris commentator said ‘the invasion might take place tomorrow,’” the front page read. Some Germans were speculating that the western Italy attack was a distraction prior to a beach landing near Anzio, the News-Sentinel reported. They weren’t far off. In just weeks, the Allies would land on beaches in Normandy in the north of France — the real D-Day invasion. And the Italian push was no mere feint, either. By May 20, American and French forces had broken through the “Hitler Line” from the Liri River to the sea. On May 26, wire services were reporting that Allied forces from the Anzio beachhead had met with armies from Terracina and were headed to Rome with the Axis forces on the run before them. 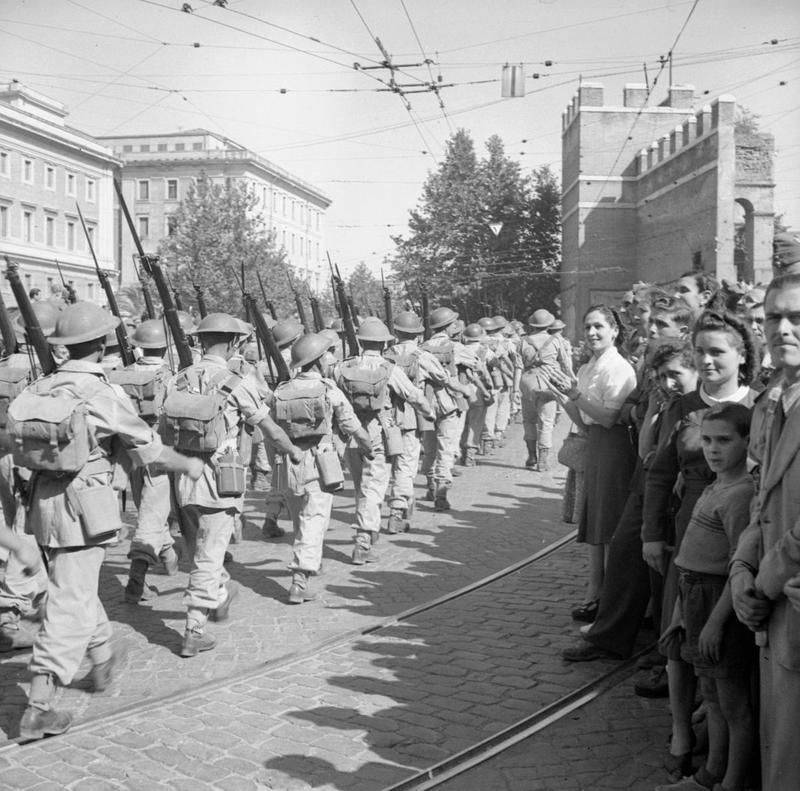 On June 5 — just a day before all hell would break loose for the Nazis — Rome fell to the Allies. Not every bit of news about Lodi soldiers overseas had to do with World War II. Occasionally, they sent home news about promotions, day to day live in Europe, or even letters like the following two, which describe an invitation to a traditional Maori funeral and life as a nurse in New Guinea. “Well, the weather is still bright and sunny — lately we have had several wet days, but the rain seldom lasts more than a day, except in winter when I think it really lets loose. “The carvings in the buildings were really worth seeing. A hand-carved Maori carving is worth a considerable amount of money, although now, this work has been rather over commercialized and can be bought anywhere in New Zealand for considerable prices, and they are mostly machine carved, so really are worthless. Capt. Stouder is serving with the First Marine Amphibious Corps and has been overseas for almost a year. Stationed at a new General Hospital being erected in New Guinea is Second Lieutenant Myrtle Neufeld ... Neufeld arrived in New Guinea in January and promptly started work in connection with the erection of the big general hospital. “At the resent time I live in a staging area in a thatched hut. We sleep in cots which sag in the middle and are extremely uncomfortable. The latrine is one of the old-fashioned out-door type and the paper is worse than the Sears-Roebuck catalogue. When we have water, we wash exclusively out of our helmets. We have no ironing facilities, so to get a crease in our pants we sleep on them overnight. And our shirts we hang them on a hanger without wringing them out. It is amazing what you can do when you have to. “Incidentally, the only thing we can wear at any time is khaki pants, shirt, no tie and leggings at night. It seems very funny going to church with pants on. We have church every Sabbath. Even 75 years ago, Lodians were active in the wine industry. The federal Office of Price Administration announced it would create an industry committee to advise it on wine pricing. Six from Northern California were selected, and four of them had Lodi connections: Lee Jones, J.B. Cella, Herman Wente and Louis Petri. Lodi resident A.R. Gower was surprised by a visit from his brother, A.A. Gower of Butte, North Dakota. The visit was especially surprising as the brothers had not seen each other in 56 years. The North Dakota Gower stopped in Lodi en route from Southern California, where he visited his son and daughter, and Eugene, Oregon, where he planned to check in on a sister-in-law. On the same day, the paper warned that more than 500 delegates from the Loyal Order of the Moose and the Women of the Moose statewide organizations were on their way to Lodi for the Mid-Winter Conference. The two-day event was a catch for the Lodi Moose Lodge, which was founded in October 1940. The News-Sentinel praised the 52 young men and 32 young women who made up Lodi Academy’s Medical Cadet Corp. The 84 young people had just undergone an inspection and drill to wrap up their first semester of training. It was the first class to include women. Rossini’s “The Barber of Seville” became the first opera to be staged (rather than just to visit) in Lodi. Soprano Amelica Scalzo played the role of Rosina, with Max Lorenzini as Figaro, Salvatore Messina as Count Almaviva, Antonio Meloni as Doctor Bartolo and Charles Goodwin as Don Basilio. The Stockton Symphony Orchestra accompanied the show, which was perform at the Lodi High School auditorium. R. Parker Haydon, a veteran who was wounded in World War I, was awarded a Purple Heart 25 years after his service. Haydon and 26 comrades were wounded by German artillery fire on Sept. 26, 1918 as they went “over the top” in the Meuse-Argonne offensive. The American Guernsey Club announced that Lodi would be the location of the largest purebred Guernsey sale west of the Mississippi. A visit home by Sgt. Erwin Litz, Army Air Forces, spurred the News-Sentinel to catch up with his sister, Mrs. Elsie Bieber. Her brothers Cpl. Johnny Litz, Army Air Forces, Pvt. Ted Litz, Army, and Seaman Edwin Litz, Navy, were also serving. Erwin and Edwin were able to visit home for Easter, the News-Sentinel reported. Thornton farmer Salvador Martinez was operating a tractor when he was struck by lightning and killed. The U.S. government seized control of Montgomery Ward after the company’s president, Sewell Avery, refused to comply with wartime orders. A team of 40 fully equipped members of the 740th Military Police battalion arrested Avery. On Jan. 6, 1944 the Stockton and San Joaquin Toastmaster clubs held a joint meeting at the Flying A Waffle Shop in Lodi, hoping to attract members interested in starting a local chapter. The meeting was a success, with 17 Lodians joining up. Sam Salas of Lodi Funeral Home was named the temporary chairman, with Harry House as the secretary. A second meeting was held Jan. 13 to select permanent officers. House was selected as the club’s first president, and it received its charter on Feb. 28. The Toastmasters’ exploits were a regular feature of the front page in 1944, with speeches covering topics such as a visit to Ireland (complete with a visit to ancient tombs), religious tolerance and the benefits of dry cleaning. On May 17, 1944, Lodi women took to the News-Sentinel to propose the formation of a Toastmistress’ Club for women. A vote made the club a reality on May 30. The club, which still exists today (and is now open to both men and women), helps members grow their skills as public speakers. The Toastmasters meet at 7 p.m. each Tuesday at Grace Point Church, 801 S. Lower Sacramento Road. For more information, visit www.loditoastmasters.com. House was busy in 1944. In addition to heading up the Toastmasters, he also stepped in to lead Lodi’s brand-new Kiwanis Club. The club was announced on May 18 on the front page of the News-Sentinel. “The Kiwanis club of Lodi, the first club of its kind to be organized in this city, was formed Monday evening in the Moose clubrooms under the sponsorship of the Stockton Kiwanis club,” the paper wrote. Today, the club hosts the Fourth of July Pancake Breakfast and Parade of Lights every December. The club meets at 7 a.m. each Thursday at the Eagles Lodge, 217 E. Lockeford St. For more information, visit greaterlodi.kiwanisone.org.